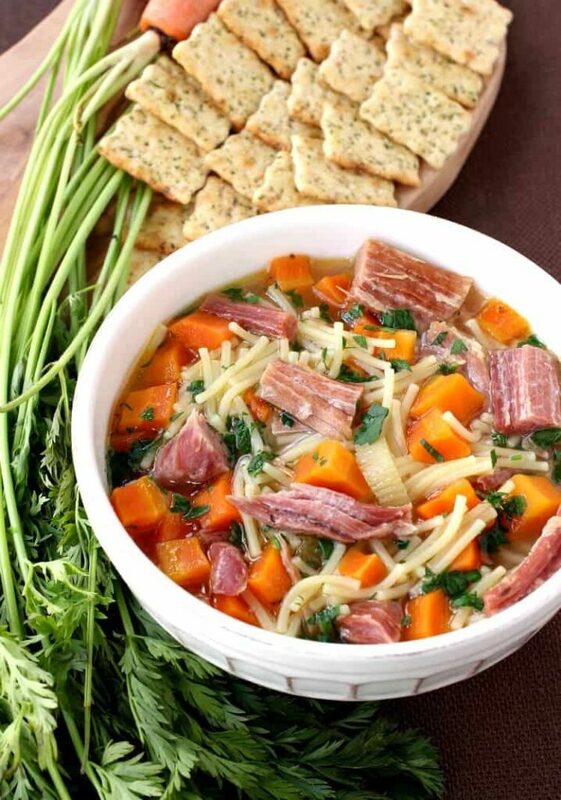 Make this Slow Cooker Ham and Noodle Soup recipe with a leftover ham bone! This leftover ham recipe will feed your family for days! Need a ham recipe? 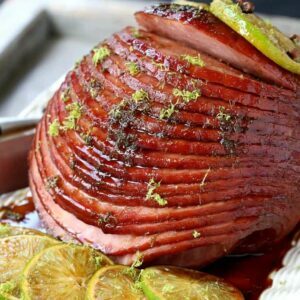 Try our Captain and Coke Glazed Spiral Ham for a boozy ham recipe that will steal the show! Ok, so if you don’t have a ham bone how are you going to make this recipe? You’re not. I have to say there aren’t really any substitutes for this recipe. You can definitely take some shredded ham, carrots and celery and let it simmer in some chicken broth and then add your noodles. That’ll be good too – but nothing really can substitute for homemade ham stock from the ham bone. Just like the turkey carcass at Thanksgiving…we’re always stealing the ham bone from my mom’s house after a holiday meal. It’s weird, but I’m telling you we can make this soup and have dinner for days. So steal yourself a ham bone from an unsuspecting relative or use your own ham bone from Sunday’s dinner and get ready to make some soup! 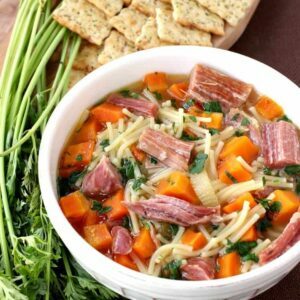 How Do You Make Slow Cooker Soup? Cut away most of the meat from the bone and save it to add in when the soup is close to done, you’ll need about a pound of leftover ham for the soup. 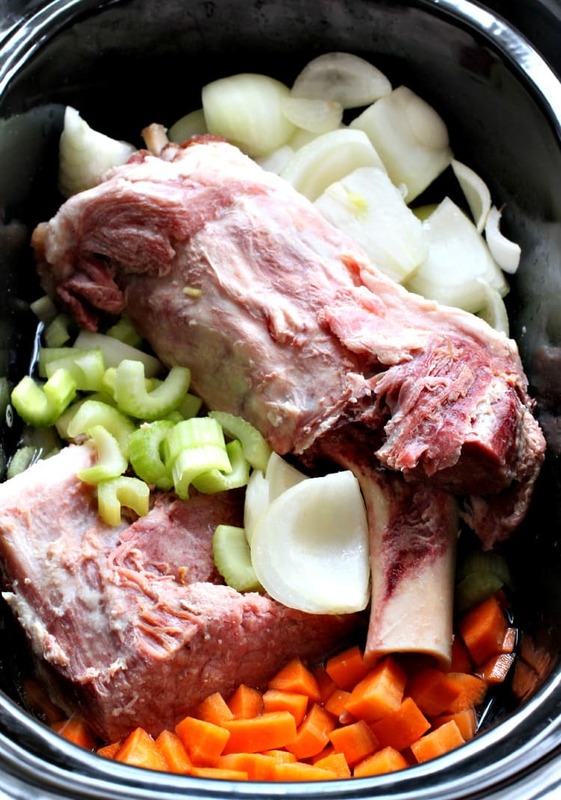 Everything goes into the slow cooker, the bone, carrots, onions, celery a bay leaf and about 8 cups of water. To make the best most flavorful stock, you only want the water to just cover the ham bone so use that as a general rule. Not so nice to look at, but I wanted to show you the size of the bone we’re using….We eat big here! Cook for 6 hours on high and you’ll end up with a rich, delicious, homemade ham stock. You can also do this on your stove top if you have time, just throw everything into a pot and let it cook down for about 3 hours. 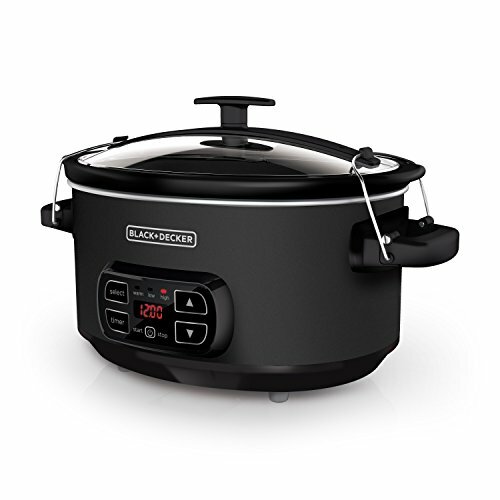 But the slow cooker is always a good option for when you don’t have time to sit and watch the pot boil. Now it’s time to grab that ham bone out of the stock and get rid of it. That ham bone has done its job now, twice. At this point you can taste your ham stock for seasonings and add in any salt and pepper you think it might need. The ham bone will add a lot of saltiness to the stock so make sure you test it out before adding any additional salt. Get your ham that you saved from the bone and shred it into big pieces and add it to the stock. 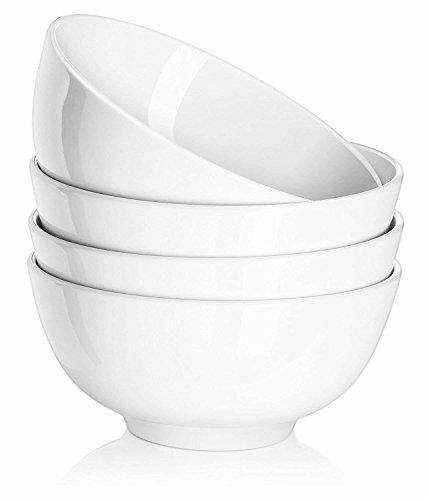 Next throw in a couple of cups of short tube pasta or this short cut spaghetti that we used here. Mix it in and let it cook for another half an hour on high. I mean, we can kick chicken noodle soup to the curb! 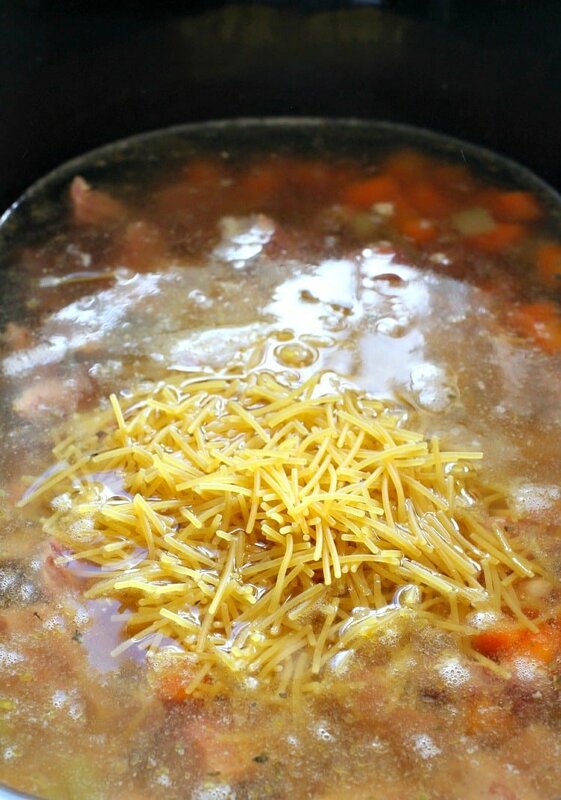 This leftover ham soup is so good, we’re counting the days until we make another ham! Another great thing about this soup recipe is that is literally feeds a crowd. So have another party, invite your friends over or just have dinner for your family for a couple of days. The best part about this soup recipe, like many soup recipes is that it just gets better the next day! 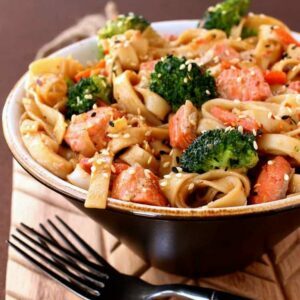 Leftovers are always the best, because who wants to cook dinner every night? 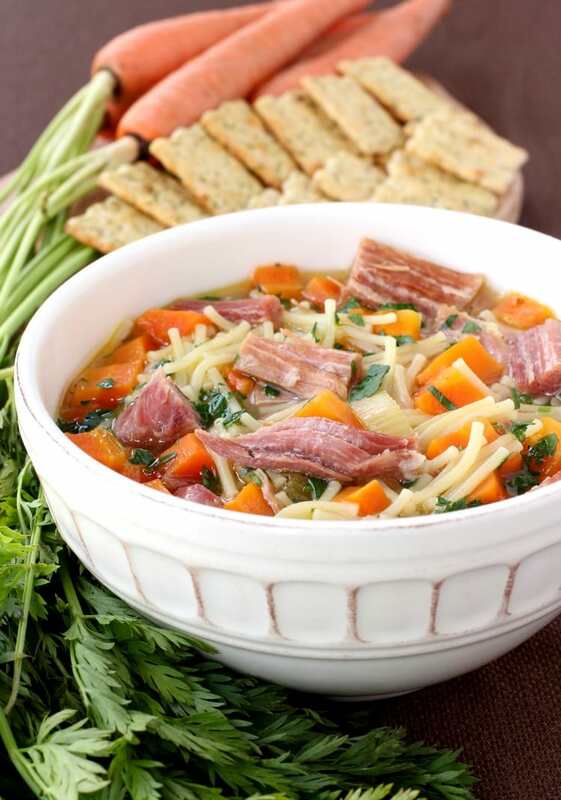 This delicious and hearty soup recipe is the perfect way to use up your leftover ham! 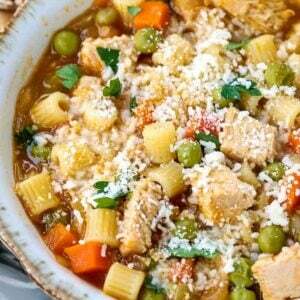 Add all the ingredients except the pasta and the 1 pound of ham to a slow cooker. Remove and discard the ham bone and the onion quarters. Taste the stock for seasonings, then add in the pound of reserved ham and pasta. Stir, cover and cook on high for an additional 30 minutes. Garnish with the chopped parsley if desired. If you’d rather make this recipe on the stove top, just follow the same instructions in a dutch oven or soup pot and cook for about 3 hours, simmering. 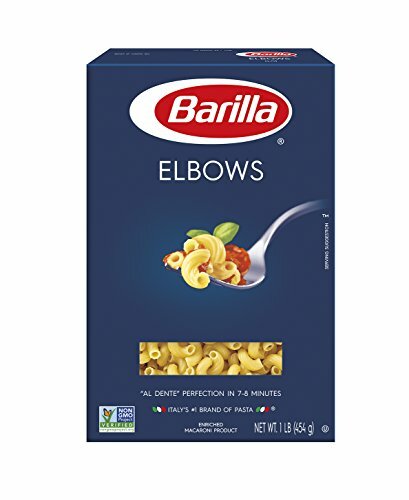 Taste for seasonings, remove the ham bone and add the pasta. Cook for another 10 minutes until the pasta is tender.